Tucked among the buildings of the Cedar Park office complex near Interstate 15 and 5300 South lies a cafe on the move. A few years and one owner ago, Café Seoul was located at 4500 South. And prior to that, the Korean barbecue and Japanese restaurant occupied a tiny location by the Century 16 Theaters on 3300 South and State. Café Seoul does feature sushi, but I tried the entrees, which looked particularly enticing. The bibimbap (say that 10 times fast) and the chicken bulgogi are highly recommended as signature Korean dishes, and cheese tonkatsu as a signature Japanese dish. 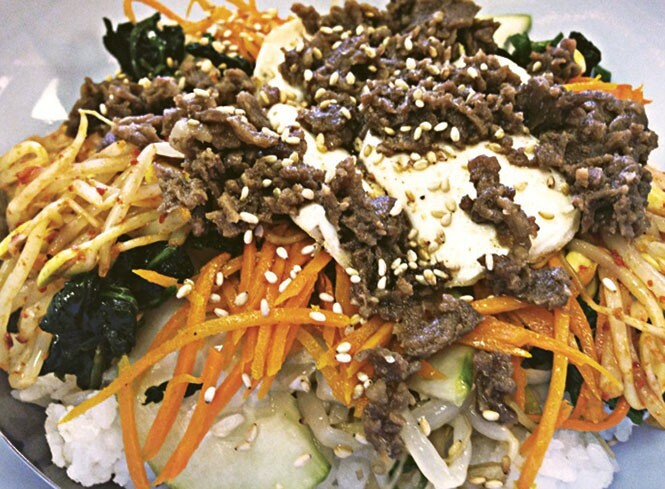 Bibimbap, meaning "mixed rice," is a bowl of white rice with sautéed vegetables—carrots, bean sprouts, cabbage, spinach and cucumber—topped with an egg fried over-easy and sweet shredded beef. It's a fresh, filling dish with a lot of flavors moving about. Add the house hot sauce; it may have a ketchup-like consistency, but it has a kick. Bulgogi is thin-sliced beef or chicken, marinated in soy sauce and spices, served with cooked vegetables. Café Seoul's bulgogi comes in barbecue or spicy varieties. The barbecue style was moist and tender, marinated to perfection. There may not be a lot of recognizable barbecue flavor, but it was too delicious for that to matter. I'd follow Café Seoul anywhere.